Back in 1998, Lars Schoultz published Beneath the United States: A History of U.S. Policy Toward Latin America. The core argument is that policy making has been based on the belief in Latin American inferiority. 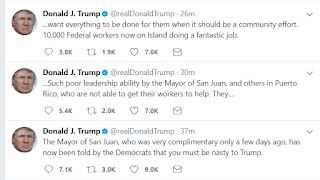 That should inform how we understand Donald Trump's response to Puerto Rico. It is their fault. 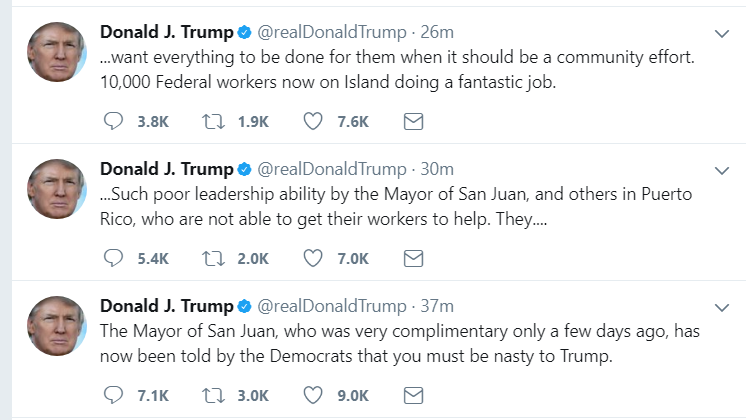 This comes on the heels of his tweets about how Puerto Rico is a disaster to begin with and needs to pay the banks. In short, Puerto Rican leaders and weak and incompetent. Only the mighty U.S. government can save these poor people, who are incapable of doing it themselves. And, of course, they will need to pay for our beneficence. They also need to be grateful. Even better if they show public gratitude to Donald J. Trump. If not, he'll go on Twitter to show his displeasure. You mean the Cuban government agreed to the terms and took the cash. Second, diplomatic normalization under the Obama administration helped encourage this development. The legal challenges are all the more important because the doctors have lost a common backup plan: going to the United States. The American government, which has long tried to undermine Cuba’s leaders, established a program in 2006 to welcome Cuban doctors, with the aim of exacerbating the island’s brain drain. Attacking in the courts and publicizing this practice is an unforeseen outcome of normalization. Umberto Eco's Travels in Hyperreality was an impulsive used bookstore purchase. It consists of only loosely connected essays. The hyperreality one is good--he traveled around the United States to examine how we construct different realities. Sometimes they are copies of European originals and sometimes, like Disneyland and Disney World, we construct fake worlds that are intended to be artificial but actually better than reality. And he can be pretty funny. Some of it veers into the impenetrable: "But this sport squared (which involves speculation and barter, selling and enforced consumption) generates a sports cubed, the discussion of sport as something seen" (p. 162). I still am not sure what he's getting at there. And he kept using the word "bricolage." Yet he can be funny even with the dated (the essays span from the late 1960s to the 1980s) stuff, like a discussion of jeans (which for him appeared to be a relatively new thing). He had heightened awareness of how they fit: "A garment that squeezes the testicles makes a man think differently" (p. 193). Indeed. El Salvador continues to struggle with elevated levels of criminal violence perpetrated by street gangs, drug trafficking organizations, members of the security forces, and other criminal groups. The Attorney General’s Office and courts have taken some positive steps towards tackling impunity for current and civil war-era crimes. However, a history of corruption and favoritism within those institutions continues to undermine citizens’ faith in the legitimacy of their actions. Finally, El Salvador confronts a challenging road ahead characterized by uncertainty over the implications of an overturned amnesty law, low rates of economic growth, and a new U.S. president in the White House. Corruption, violence, strict abortion laws, stubborn poverty rates, slow economic growth, indifference and unpredictability from the Trump administration you name it. Go take a look but don't expect to feel good afterward. Simeon Tegel has a nice take on Latin America's relationship with China. That relationship is often portrayed as one-sided, where Latin America is becoming more dependent, China is spreading its influence, and the like. But it ignores how Latin American leaders are consciously forging their paths, picking and choosing, and avoiding too much entanglement. But despite Beijing's best efforts – and the uncertainty about future relations with the U.S. as Trump seeks to renegotiate NAFTA and other trade deals – the RCEP remains on the backburner with no Latin American leaders talking up the deal. "For ideological reasons, it's very difficult to enter a trade pact led by China," notes Roncagliolo, who also stresses that Latin American nations are not about to repeat the mistakes of the past when the region was in thrall to Spain, Britain and then the U.S.
Others go further. "China is not the way of the future for Latin America. I just don't see it," says Dawisson Belém Lopes, a professor of international politics at Brazil's Federal University of Minas Gerais, highlighting how Beijing simply cannot compete with the U.S.'s "soft power." We should start with the assumption that Latin America (with perhaps the exception of basket cases like Venezuela) has agency and has choices, so is not just desperately reaching out to China and it is definitely not passively accepting Chinese "encroachment." Yet that's precisely how so many stories and congressional debates seem to go. The government in Venezuela is uncooperative in verifying whether its citizens pose national security or public-safety threats; fails to share public-safety and terrorism-related information adequately; and has been assessed to be not fully cooperative with respect to receiving its nationals subject to final orders of removal from the United States. Accordingly, the entry into the United States of certain Venezuelan government officials and their immediate family members as nonimmigrants on business (B-1), tourist (B-2), and business/tourist (B-1/B-2) visas is suspended. First, media stories lump Venezuela in with North Korea, Syria, etc. but it's a totally different case. It is highly targeted and Venezuela is not a military threat. Second, as result of #1, it's a good bet that adding Venezuela was simply a way of claiming the original ban wasn't aimed at Muslims. The ACLU has already mentioned this. Third, this isn't actually a policy change. It's an expansion of existing sanctions, or at least appears to be since I haven't seen how many Venezuelans were added to the list. Update: quoted in this Bloomberg article on the topic. Jorge Castañeda (academic and former Mexican Foreign Minister) argues in an NYT op-ed that Donald Trump and Raúl Castro have an incentive to work together on Venezuela. As Venezuelan resources dry up, the Cuban leader understand that long-term he really needs the United States. Trump wants (or claims to want) democratization in Venezuela and Cuba is the only country with enough clout to have a decisive impact. Safe haven in Havana is an incentive for leaders who will otherwise face imprisonment. Venezuela has a lot to gain from a grand bargain including Cuba and the United States, but so do Cuba, the United States and the rest of Latin America. At the moment, it might seem naïve to think that Mr. Maduro and his allies would accept a deal in which he leaves power just as he appears to have consolidated it. But sometimes that is the best moment to reach an agreement. Venezuela’s situation is untenable, and the Cubans, who have been around forever, know that. Does Mr. Trump? I tend to agree with this. The main problem is that in the past year or two, incentives haven't worked the way we would expect them to. There are incentives for Latin American countries to work together, but it hasn't happened. Perhaps more importantly, Donald Trump a) has domestic incentives that sometimes contradict foreign policy ones; and b) does not understand those incentives. He is chasing a small group of voters who loved the Bay of Pigs and might decide to stick with them even though they cannot actually get him elected. You know what Castañeda doesn't mention? The presence of nefarious external actors. And he shouldn't. As Harold Trinkunas and I talked about on Friday in my podcast, their impact is overstated. 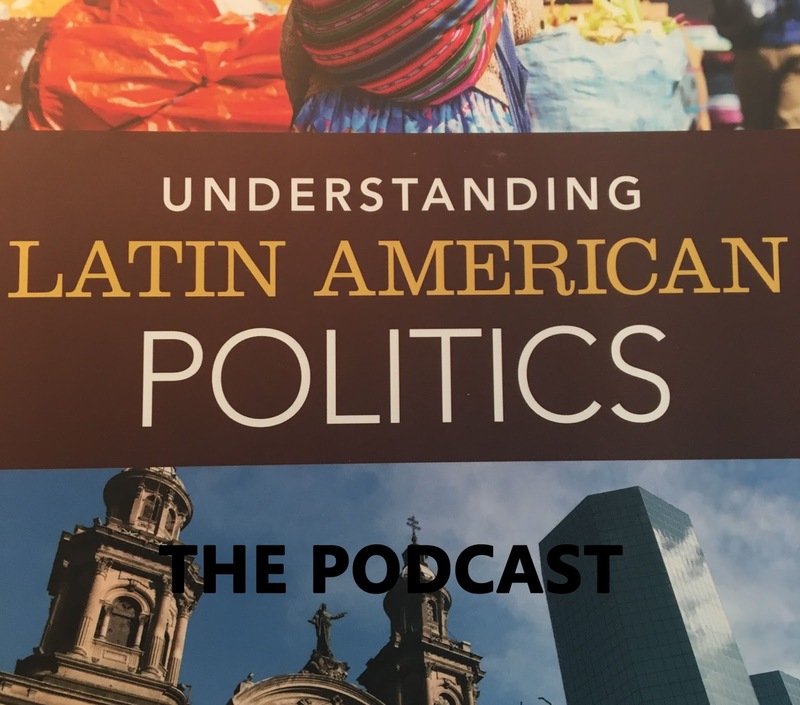 In Episode 42 of Understanding Latin American Politics: The Podcast I talk with Harold Trinkunas, who is Senior Research Scholar and Associate Director at the Center for International Security and Cooperation at Stanford University. Among other things, he’s done a lot of research on Venezuela, including a book on civil-military relations. Last week he gave testimony at a hearing for the Western Hemisphere Subcommittee of the House Foreign Affairs Committee about Venezuela, and that was the topic of our discussion. Chile’s central bank said on Wednesday it had revoked a reciprocal credit line with its Venezuelan counterpart, citing what it called Venezuela’s failure to pay back its debts. In a statement, Chile’s central bank said it had notified Venezuela’s central bank and that the line would be cancelled within 10 days. The monetary authority said it has been taking steps to mitigate its exposure to Venezuela since 2014 and was currently owed $2.1 million by that country’s central bank. “The progressive deterioration of Venezuela’s financial indicators and the (Venezuela central bank‘s) behavior in prior years under this arrangement had already motivated us to adapt measures to safeguard the Central Bank of Chile’s wealth,” the monetary authority said in a statement. The Venezuelan central bank had made “intensive use” of the credit line in recent years, Chile’s central bank said. Venezuela is running low on reserves, cannot keep up oil production, has no other exports, and is deeply in debt. Latin American leaders may talk about sovereignty, non-intervention, or even ideological affinity, but they want their money. In a sense, this is not a good development for the United States. If Venezuela finds its western hemisphere sources of money unavailable, then it will lean more heavily on China and Russia, which for now continue loaning money partly to tweak the United States and partly to avoid regime change, because who knows what a new government will want to repay. When the U.S. squeezed Cuba with the embargo, it hurt the Cuban people and helped the Soviet Union. Update: Brazil is also getting edgy. From Trump's remarks at a dinner he hosted during the UN conference for the presidents of Brazil, Colombia, Panama, and Peru. We're fortunate to have incredibly strong and healthy trade relationships with all of the countries gathered here today. They're doing very well with the United States. We want to try and change that a little bit so we can turn the tables just a little bit. You're doing very well, and I congratulate you all. Nikki knows exactly what I'm saying, and Rex knows exactly what I'm saying. But we have great relationships, and we do great trade. Our economic bonds form a critical foundation for advancing peace and prosperity for all of our people and all of our neighbors. These types of statements weaken the United States in important ways. They undermine confidence in agreements the U.S. has pushed for, they encourage Latin American leaders to seek more economic agreements outside the hemisphere, and they reduce the leverage the U.S. has to deal with other issues in the region. Of course, this dinner also included discussion of Venezuela, where Juan Manuel Santos said again that there was no military option. Trump's own words end up meaning that Latin America is listening to him primarily to rebut foolish things he says. His comments about wanting to hurt Latin America more on trade gives the other presidents zero incentive to work with Trump at all. In other words, the U.S. is not leading anything at the moment. Inside Higher Ed talks about the call for retraction of Third World Quarterly's pro-colonialism article. This is not a good idea. Just ignore the damned thing. Or if you feel the need to engage with it, just call it a piece of crap and move on. There are a lot of crappy academic articles, some of them to the point of being laughable. They are generally laughed at and ignored. With some like this, you stop laughing and get annoyed or even angry. But that doesn't merit censorship. The peer review process exists to ensure rigor in published research. We understand that this piece was rejected after review, and that decision should have been respected and this sub-par scholarship should never have been published. Editor or editors at Third World Quarterly allowing this piece utterly lacking in academic merit to be published should be replaced from the Editorial Board. Hmm. This is hearsay so I would like to know more--the editor says differently, or at least suggests that peer-review led to its acceptance rather than the opposite. I really wish I could see the reviews. If anything, I'd say release the reviews and leave them anonymous. But it's a moot point. It's a "viewpoint" article, which is like an op-ed. I imagine you do not agree with all op-eds but that does not mean we censor them. This is an egregiously poorly written and argued op-ed that indirectly says genocide is A-OK, but it shouldn't be censored. Retraction would likely give it a lasting impact as a martyr. Update: even Noam Chomsky agrees with me. Update (9/29/17). The publisher released a statement. There was indeed a peer review, where one review said minor revisions and the other said reject. The minor revisions one was returned in just four days--I would love to see it. The editor decided to split the difference and do a major R&R, which was clearly a bad choice given the low quality of the article. Also, the publisher specifically denies this was click bait. I am not sure I believe it. Updated (10/10/17) The article has been withdrawn because of violent threats against the editor. This disgusts me. The threats themselves are intended to stifle opposition, which is ironic given the topic at hand. And I hate the idea of caving into that. Update (3/23/18) The Chronicle of Higher Education posted an update. It mentions Chomsky without noting what he actually said. The author puts it into a simplistic and pretty useless binary "old left" vs. "new left" frame. Bottom line, though--the guy is not harassing anyone and should not face any disciplinary measures. Common sense, people. R. Evan Ellis: Russia and China are serious threats. Sanction the crap out of Venezuela. 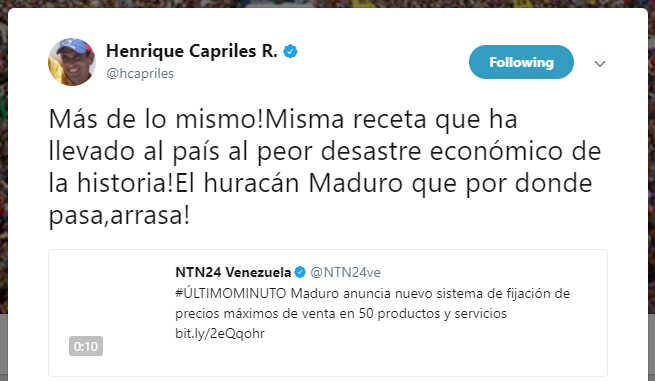 Unfortunate about how it will hurt Venezuelans, but it'll also save them. Lean on China and Russia. Francisco Toro: Cuba has a major and extensive influence over the Venezuelan government. Focus on intelligence and proliferation (i.e. giving weapons to Bolivarian militia). No policy recommendations. Harold Trinkunas: Great quote: "We should avoid over-connecting the dots." External actors mostly trying to make money. Use combination of diplomacy and sanctions targeted at individuals. We should always start by consciously refusing to over-connect dots--there could be a great analysis of how doing so leads to bad policy. I disagree almost entirely with Ellis' policy prescriptions, which I think will make the crisis worse. Quico did not make any policy prescriptions, but in terms of U.S. policy I think his observations should be wrapped into U.S.-Cuban relations. Cuba's role will diminish once democracy returns to Venezuela, and the U.S. can put pressure on the Cubans by offering carrots elsewhere. Juan Gabriel Tokatlian takes a historical look at Latin American diplomacy to argue that there is precedent for dealing with a situation like Venezuela. He cites the Contadora Group in particular, which worked on the Central American crisis in the 1980s. Today, the world and region are immersed in dynamics that are not dissimilar to the past. The case of Cuba shows what the region must avoid. Instead, Latin Americans should emulate cooperative efforts made in Central America by the Contadora Group. This method could help to stabilize the situation in Venezuela before it is too late. Whether the states of Latin America have learned from the past or have the political will, however, remains to be seen. He uses the case of the Cuban Revolution to show the passivity of Latin American governments, which allowed for Cuba's isolation. Doing the same with Venezuela could have the same effect, which in practice could mean years more of repression. This has been a vexing question. It is in the collective interest to find a solution to the crisis. Venezuela's problems will spill over. But that spillover is not uniform. Bolivia is more committed to ideology, for example. Plus, such an effort requires considerable time and commitment. Colombia is implementing a peace process while Brazil is trying to impeach everyone. Article after article has been written about what Latin America needs to do. More should analysis what they're actually doing now and why. I gave my pessimistic view about all this earlier this year. This tweet says so much. 1. 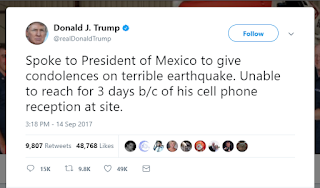 President Trump does not care about Mexico, even to the point of ignoring natural disasters until public clamor finally prompts him to acknowledge it (remember too that he ignored Mexico's offer of help after Hurricane Harvey. 2. He believes we're stupid. 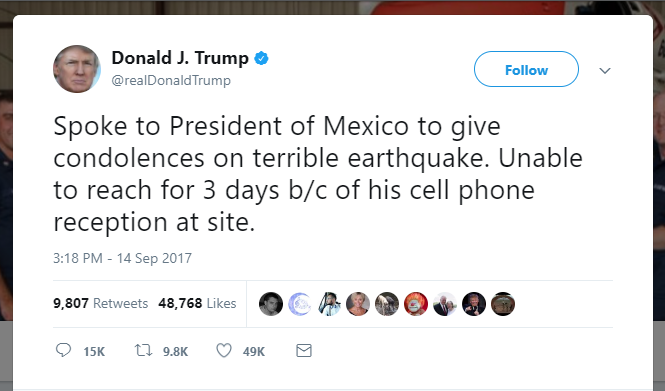 Even if you take the tweet at face value, one reporter who was around where Enrique Peña Nieto was traveling had a cell signal. It's insulting and he knows it's insulting. 3. He believes Mexicans are stupid as well. These tweets are part of diplomacy. Chris Sabatini has a recent piece on the disasters of diplomacy for Latin America policy and this just adds to the disaster. 4. U.S.-Latin American relations are going downhill fast. This comes on the heels of an ill-advised announcement about Colombia. A White House memo states that Venezuela and Bolivia are not adequately combating narcotics and that Colombia may be decertified, which would mean aid cuts and possibly other measures. In addition, the United States Government seriously considered designating Colombia as a country that has failed demonstrably to adhere to its obligations under international counternarcotics agreements due to the extraordinary growth of coca cultivation and cocaine production over the past 3 years, including record cultivation during the last 12 months. Ultimately, Colombia is not designated because the Colombian National Police and Armed Forces are close law enforcement and security partners of the United States in the Western Hemisphere, they are improving interdiction efforts, and have restarted some eradication that they had significantly curtailed beginning in 2013. I will, however, keep this designation under section 706(2)(A) of the FRAA as an option, and expect Colombia to make significant progress in reducing coca cultivation and production of cocaine. As refresher, one year ago President Obama also singled out Venezuela and Bolivia (he also emphasize the importance of drug treatment, which Trump did not include). I've written before why putting Bolivia on the list contradicts empirical evidence. But Obama correctly saw Colombia as an ally. Trump's Latin America policy (the "Trump Doctrine," if you will) has been characterized by threat, bluster, then little change. We can only hope that holds with Colombia as well. The U.S. can only lose by penalizing Colombia, especially at such a delicate time. Literally nothing good can come of it--it could endanger peace, disrupt markets, affect the Colombian peso, and undermine regional confidence (to the extent there is any). Some of these might start happening anyway in anticipation of a possible policy change. All to "scare" Colombia into doing what the U.S. wants. In Episode 41 of Understanding Latin American Politics: The Podcast I talk with Michelle Bonner, Associate Professor of Political Science at the University of Victoria. She studies democratization and human rights in Latin America. Going from an article she recently published in Latin American Research Review we discuss the state response to mining protests. How does the ideology of the government matter? What is "dialogue"? What does this tell us about democracy and repression in Latin America? A political scientist has published an article arguing that colonization was positive and that former colonies should either recolonize or copy the colonizer. For the last 100 years, Western colonialism has had a bad name. It is high time to question this orthodoxy. Western colonialism was, as a general rule, both objectively beneficial and subjectively legitimate in most of the places where it was found, using realistic measures of those concepts. The countries that embraced their colonial inheritance, by and large, did better than those that spurned it. Anti-colonial ideology imposed grave harms on subject peoples and continues to thwart sustained development and a fruitful encounter with modernity in many places. Colonialism can be recovered by weak and fragile states today in three ways: by reclaiming colonial modes of governance; by recolonising some areas; and by creating new Western colonies from scratch. My first thought was that we're just being trolled. If we just take the case of Latin America, extolling colonialism require you to believe that at a minimum that genocide is positive, forced labor is a benefit, militarism works well, and racism is acceptable. Those are not things the typical person believes. It is ironic that an article arguing about "research that is careful in conceptualising and measuring controls" and "includes multiple dimensions of costs and benefits" does precious little of either. Cherry-picked examples don't add up to much. I would've loved to see the peer reviews of this one. Perhaps they just thought it would be fun to cause some controversy. In that sense, it might be less of a trolling and more of plain old click bait. A recent academic article looks at the relationship between U.S. military aid and coup probability. Jesse Dillon Savage and Jonathan D. Caverley, "When Human Capital Threatens the Capitol: Foreign Aid in the Form of Military Training and Coups," Journal of Peace Research 54, 4 (2017): 542-557. How does aid in the form of training influence foreign militaries’ relationship to domestic politics? The United States has trained tens of thousands of officers in foreign militaries with the goals of increasing its security and instilling respect for human rights, democracy, and civilian control. We argue that training increases the military’s power relative to the regime in a way that other forms of military assistance do not. While other forms of military assistance are somewhat fungible, allowing the regime to shift resources towards coup-proofing, human capital is a resource vested solely in the military. Training thus alters the balance of power between the military and the regime resulting in greater coup propensity. Using data from 189 countries from 1970 to 2009 we show that greater numbers of military officers trained by the US International Military Education and Training (IMET) and Countering Terrorism Fellowship (CTFP) programs increases the probability of a military coup. Interesting, but I feel like there is more to this story. For Latin America, this should be disaggregated into Cold War and post-Cold War, which would provide a clearer picture. The U.S. has been pouring military aid into Colombia (no coup), Mexico (no coup), Guatemala (no coup--failed autogolpe in 1992) and Honduras (2009 coup). But if you isolate the 1970s and 1980s, you'd see many more. In other words, context would make this a richer discussion. Nonetheless, the basic thrust of the paper should be part of any aid discussion. All things being equal, making a military institution in a developing country (economic development should be part of this) strong vis-a-vis the civilian government is a dangerous business. I've written a good amount about how Donald Trump has squandered soft power and lost leverage in Latin America. Now the Senate Appropriations Committee report on its budget for the State Department and Foreign Operations serves up a harsh assessment. The lessons-learned since September 11, 2001, include the reality that defense alone does not provide for American strength and resolve abroad. Battlefield technology and firepower cannot replace diplomacy and development. The administration’s apparent doctrine of retreat, which also includes distancing the United States from collective and multilateral dispute resolution frameworks, serves only to weaken America’s standing in the world. Boom! This is not word mincing. The Committee is concerned that representatives of Afro-Colombian, indigenous, and other minority groups, as well as rural women, are not sufficiently integrated into the process of implementing the peace agreement, and urges the Government of Colombia to prioritize engagement with these communities, including through economic and social development programs. The Committee underscores the importance of security and stability in formerly-held FARC areas, particularly in the Pacific coast region. Certainly not a Trumpesque policy prescription. The U.S. has a positive role to play in Colombia and elsewhere, and needs the personnel and resources to do so. Nicolás Maduro proposed eight new laws to the Constituent Assembly. They're a combination of delusion and fantasy. They would fix prices for 50 goods while increasing the minimum wage by 40%. The main result will be to increase both scarcity and inflation. There would also be a law that punishes "economic crimes" that vaguely covers speculation and other natural consequences of price fixing and general economic mismanagement. 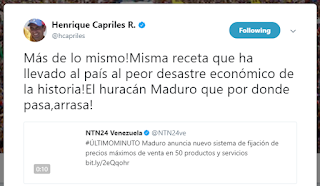 He also ordered PDVSA to increase oil production. Just snap your fingers and it'll happen. Never mind that PDVSA is a total disaster and production is at a 25 year low. In a country wracked by economic woes and violence, he also called for increased tourism. Finally, he announced that Venezuela would soon be free from the clutches of the dollar and would be instead making international payments through a basket of currencies. “If they pursue us with the dollar, we’ll use the Russian ruble, the yuan, yen, the Indian rupee, the euro,” Maduro said. Hurricane Maduro wipes everything out wherever he goes. This morning I went on WFAE's Charlotte Talks to discuss Deferred Action for Childhood Arrivals (DACA). If you're interested, here is the link, where they've already posted the show. Since there were threads I didn't get to follow on the show, I decided to do a podcast as a follow up, so just click here. The key question is whether Congress will actually act or not. Under what circumstances could a Dream Act pass these days? Senator Thom Tillis is putting together what he calls a conservative Dream Act, but defining that will be important. If it denies any pathway to citizenship, then it will face stiff opposition from Democrats. If it provides any avenue for citizenship, it will be stiffly opposed by Republicans. Overall, many House Republicans in particular are opposed to any reform of any kind. It's a small needle to thread. Further, these days the Senate is more hospitable than the House, where any reform will be controversial. We talk about "bipartisanship" but there is the question of the so-called "Hastert Rule" whereby the majority party does not allow a vote on legislation that might pass with a minority of the majority supporting it. Paul Ryan has no incentive to let anything through that does not have majority Republican support. Time is a problem. The Dream Act was first proposed in 2001. That's right, before 9/11. Now Congress has six months to overcome all the past challenges, while Trump is simultaneously calling on Congress to pass tax reform, which is not exactly a simple task. Back in 2010, the Senate could not pass the Dream Act. Critics said this would hurt Republicans, which was not true. It did pass the House. Then in 2013 the Senate passed an immigration reform bill, which the House wouldn't even vote on and John Boehner declared it dead. That didn't hurt Republicans either. The lesson for Republicans? Not acting will not hurt their re-election chances. In fact, doing nothing might boost their chances in the next primary. And Donald Trump tweeted that he would "revisit" the issue in March 2018 if Congress failed to act. Since Trump has already declared executive order on the issue to be unconstitutional, skeptical Republicans could logically take this to mean he might cancel DACA without a replacement if they don't act. The Trump administration has ended DACA, Deferred Action for Childhood Arrivals. The statement by Attorney General Jeff Sessions is littered with questionable assumptions and falsehoods. Without irony, he says that ending DACA shows compassion, saves lives, promotes assimilation, helps poor Americans, raises wages, and combats terrorism, all of which are false. Insultingly false. Fly in the face of both common sense and empirical evidence false. This does not mean they are bad people or that our nation disrespects or demeans them in any way. This is red political meat for xenophobes and not much else. Hundreds of thousands of people who grew up in the United States for reasons entirely beyond their control will be punished to please xenophobes. It is heartless, cruel, and simply mean-spirited. I've had numerous students protected under DACA, and they are universally the kind of people we want to stay, live, and work in the United States. They will make the United States a better place if we don't abuse them. Consciously destroying their lives is sick. And Trump now owns that. DACA made it impossible for President Trump to pursue the reforms needed to restore fairness to our immigration system and protect American workers [bold in original]. DACA doesn't make any legislative action impossible. In the statement he provides no basis for the logic. It is my hope that the House and Senate, with the president’s leadership, will be able to find consensus on a permanent legislative solution that includes ensuring that those who have done nothing wrong can still contribute as a valued part of this great country. If you rely on presidential leadership now, you're not in particularly good shape. Meanwhile, Mitch McConnell issued a statement. President Obama wrongly believed he had the authority to re-write our immigration law. Today’s action by President Trump corrects that fundamental mistake. That was the entirety of his statement, which does not generate much confidence in congressional action by March. Canadian negotiators are demanding the United States roll back so-called "right to work" laws – accused of gutting unions in some U.S. states by starving them of money – as part of the renegotiation of the North American free-trade agreement. The request is part of a push by Ottawa to get the U.S. and Mexico to adopt higher labour standards under the deal. This not only goes after "right to work" laws but it hits Mexican corporatism directly, which has involved corrupt deals between the government and union leaders. Therefore they rejected the idea. Overall, it's healthy to have a more public discussion of wages. An important part of my Latin American Politics class is to explain why countries can see strong economic growth and general dissatisfaction at the same time. Even if you have a job, it might pay very little and offer few to no benefits, which has become increasingly problematic in the United States. The story about U.S. and Canadian diplomats suffering serious injury because of some sort of sonic attack is just weird. It's well known that the Cuban government, like probably almost every other dictatorship, bugs diplomats as much as possible. But it has no incentive to attack the U.S., which gains them nothing while opening Cuba up to retaliation. Even more curious to me, though, is this sort of thing is low-hanging fruit for Donald Trump. So easy to tweet about, so easy to score political points with hardline Cuban-American conservatives, so easy to bluster and crow. But he isn't. The United States has stopped short of accusing Cuba of being behind the alleged attacks. The Cuban government has denied any wrongdoing and is said to be cooperating in the ongoing investigation. Why not? One current hypothesis is that someone--who else but the Russians, really?--was using them to harass U.S. diplomats for U.S. policy elsewhere. Indeed, US investigators are probing whether a third country was involved as "payback" for actions the US has taken elsewhere and to "drive a wedge between the US and Cuba," a US official told CNN. Under this scenario, the U.S. doesn't see Cuba as responsible. But that's weird too. Can the Russians actually do such things in Cuba without Raúl Castro knowing? And if he knew, we're back to square one about why he would take a big risk for no gain. Somehow, someone convinced Donald Trump that Cuba, which he loves to rail about, is not worth railing about in this instance. Since this sort of thing is right up his alley, it's hard to understand why he is showing restraint. That's almost weirder than the attack itself. The Miami Herald has a piece that is part of a trend toward portraying Venezuelans in Florida as a voting bloc that politicians need to pay attention to. And as Republicans look to defeat Nelson and maintain majorities throughout Florida in 2018, attacking Democrats on Venezuela could pay off politically, even if Florida Democrats are now talking tough on Venezuela. Unfortunately, the article only provides quotes from Republicans and has no data. A recent article in Americas Quarterly suggests that in already heavily Cuban-American Florida districts like Ileana Ros-Lehtinen's, Venezuelan-American voters are about 10% of the total. Elsewhere that's much lower. It also notes that Venezuelans do not appear to vote as predictably as Cuban Americans once did. In practice, this could mean agreeing with today's version of the Republican Party on Venezuela but not much else. I've heard plenty about Venezuelans in the United States voting in Venezuelan elections (where the government has made it as inconvenient as possible, such as forcing people in Florida to vote in new Orleans, knowing how they lean) but not so much in U.S. elections. Plus, of course, when they arrive from Venezuela they are not eligible to vote so this takes a lot of time. However, they have the money and the successful lobbying model of the Cuban American community to emulate. It does mean that candidates will find themselves needing to address the crisis in Venezuela more than they did in the past. The 5-10% in a district may or may not sway an election, but if they jam the polls during primaries then you need to pay attention to them even to get to the general election.